Birame N. Sock is a successful serial entrepreneur and currently the Founder of FlyScan, Inc, a newly developed Interactive Digital Marketing platform generating offers in real-time based on user’s social network status, location and brand preferences. Birame was the Founder of Third Solutions (acquired in 2012) and was the visionary and primary developer of MyReceipts©, the leading digital receipts platform. She was also the Founder of Musicphone, Inc., which was acquired in July 2007 by Gracenote, Inc. Musicphone was the first to launch a Wireless Music Recognition service called MusicID with AT&T Wireless and Virgin Mobile USA in 2005. Ms Sock currently serves as an Independent Board Director at Viggle, Inc (NASDAQ: VGGL), a loyalty program for television that gives people rewards for checking into the television shows they’re watching. She also served on the board of The Commonwealth Institute (Florida Chapter), a non-profit organization founded in 1997 to help women entrepreneurs, CEOs, and senior corporate executives build successful businesses and served as an Independent Director and Audit Committee Member on the Board of CKX (CKXE: NASDAQ) which was engaged in the ownership, development and commercial utilization of entertainment content. 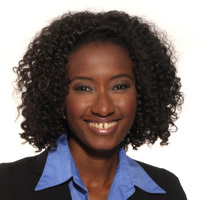 As a result of her successes as an entrepreneur, Birame Sock received the 2010 North American Cartier Women’s Initiative Award, was named by the Huffington Post as one of the Top 2011 Female Tech Founders to Watch, is a member of the Young Entrepreneur Council and the World Entrepreneurship Forum. She has been featured in Marie Claire Magazine, the Miami Herald, Forbes Magazine, the New York Times and Billboard Magazine amongst others and has appeared on CNBC and Good Morning America, and has also spoken at many leading industry events.